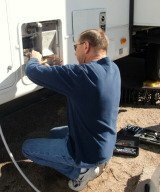 What type of RV is recommended for full timers (not yet)? We have a 24' TT and thinking of full timing when we retire or, even sooner. We are thinking maybe 5th wheel. My husband is not comfortable driving it, so I do all the driving. Maybe a Class A might be better as then he would probably drive too. Any suggestions?